While working this summer I’ve been taking a short morning and afternoon break, and I usually eat protein bars since they’re handy and I’m in a hurry. I just hate buying the so called “natural” ones, only to find they are loaded with sugar, have high fructose corn syrup, or just junk I didn’t need. And the cost? Who wants to pay $3-4 for a bar that weighs less than 4 ounces? Thank goodness I can make better ones for less! I set out to research how to make my own energy bars, but with so many dietary restrictions, none seemed to work. I finally compiled a list of ingredients that anyone can choose from to make the bars the way they want. There are many alternatives for each ingredient, so you can pick and choose. Have a nut allergy? Choose a nut alternative. Have gluten issues? Choose a gluten free grain. Have sugar issues? Choose a sugar substitute. You get the idea. Simply choose an ingredient from each category and use them to make your bars. Most people will use oats for the grain, but you can also find gluten free oats in health food stores, as well as quinoa, kamut, spelt, wheat, rye, corn meal, barley, millet, rice, teff, wild rice, buckwheat, amaranth, or chia (read all about The Benefits of Chia Seeds). Choose any combination of the following dried fruit: apricots, peaches, mangoes, papaya, oranges, dates, apples, pears, figs, kiwi, pineapple, banana, prunes, goji, cranberries, blueberries, strawberries, nectarines, currants, raisins, or cherries. Use cashews, peanuts, almonds, hazelnuts, pecans, walnuts, black walnuts, Brazil nuts, pistachios, hickory nuts, chestnuts, acorns (the white oak acorn is the best for eating), pine nuts, or macadamia nuts. Shredded unsweetened coconut is a basic ingredient, but can be substituted with coconut flour, wheat germ, cocoa powder, roasted soybeans, sunflower seeds, pumpkin seeds, flax seeds, flax seed flour, hemp seeds, or poppy seeds. Choose any sweetener you’re comfortable with – honey, molasses, maple syrup, sorghum, stevia, raw sugar, muscovado sugar, turbinado sugar, coconut palm sugar, sucanat, or monk fruit. Sea salt, Himalayan pink salt, Celtic gray salt, Hawaiian black salt, or bamboo salt will all work. Read more about Different Types of Salt and find most of them here. Water, honey, vanilla, coffee, tea, or almost any other liquid can be used. As you can see, there are lots of choices, but by no means is this a complete list. You can also add other ingredients not listed, such as cinnamon and nutmeg, or curry or cayenne pepper. I make an apple bar in the fall when apples are in season. I add raw sugar, cinnamon and nutmeg, and a bit of cayenne pepper. In the summer I like to make a bar similar to peach cobbler, with peaches, oats, and pecans. And in the winter I make chocolate almond bars or date nut bars. Grease a cake pan with oil of your choice or line with parchment paper. Chop the fruit and nuts and add to the bowl. Add the coconut, sweetener, salt, and oil and mix well. It should be like a dough. Add the extra liquid only if necessary. Press all of this into the pan and freeze for an hour or so. Cut into bars and store for up to a month in the refrigerator in an airtight container. If you are going to be giving these away as gifts, be sure to write down all of the ingredients you’ve used in case there are any food allergies. It’s always a good idea even if you are just eating them yourself so you can remember a good combination you came up with. Have fun and feel free to experiment. You never know what you’ll come up with! Thanks Debra, I didn’t know you could just freeze the mixture and that does it all. I learnt something new today. I must try this recipe indeed. I want to make the granola bars with chia seed. Question is whether to soak them first or make the bars with them not soaked. Any idea? Hey Lana! I don’t soak mine for this recipe. I’ve never tried it, but I think it would make it soggy. I’ve used them dry, right out of the bag. Thank you for this priceless article. There are zillions of recipes online for granola bars, but picking one is overwhelming, to say the least. This simplifies the process to a make-your-own project. This is a keeper! Thanks Linda! That was the main reason I created this recipe. Really, how can you pick just one and know it’ll come out the way you want? Now you can adjust it to your taste and not eat what the recipe says you need to use. Thanks, Debra, can’t wait to experiment! I didn’t know that quinoa could be eaten uncooked. Hey Deb! Quinoa can be eaten raw and can be used in recipes that way, but most people cook it. I like it toasted so that it gets a nutty flavor. Do it quicly though, because it can burn fast! Thank you Debra! Looks simple indeed. I will try it during the weekend! Thanks Anna! 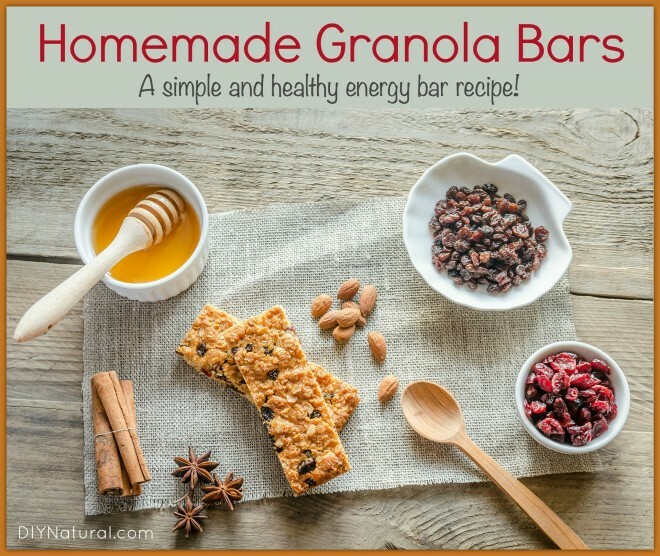 This is the most simple way I’ve found to make granola type bars. I’ve made my own granola for years and sometimes use it in these.